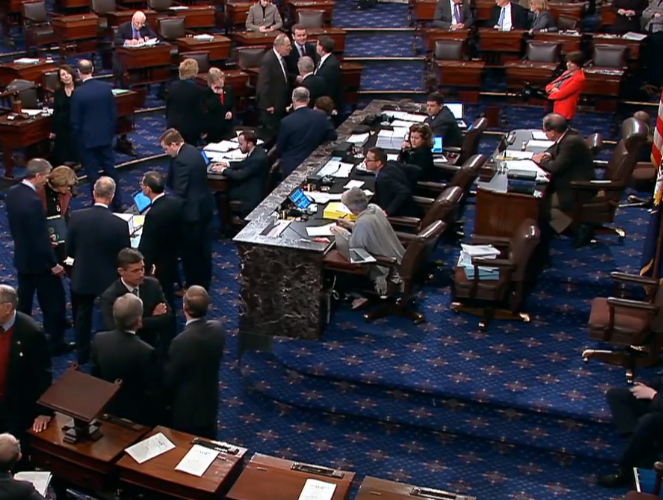 Shutdown – Dem, GOP Proposals Both Fail in Senate. Two measures to end the shutdown failed in the Senate because they didn’t reach the required 60 vote threshold. The Republican bill failed 50-47, and the Democrat bill failed 52-44. The President and Senate leadership are working on ways to find a solution. Republican Senator Mitch McConnell worked on the President’s offer of a 3 year extension for DACA and TPS recipients. It included the $5 Billion for a barrier at the Southern border. McConnell has been reluctant to engage the “nuclear option” for these kind of situations and the vote count reveals why. Democrat Senator Chuck Schumer put forth his version, which did not include funds for a wall, that would have re-opened the government only until February 8. Not a feasible solution. The nuclear option would have seen their version pass, which is only a temporary solution, and they’d be back to square one on February 9. Gridlock has occurred in the Congress previously, but never to this extent. The shutdown has gone on now for over a month, with Federal employees and the Coast Guard missing paychecks that have placed all of them in financial jeopardy. Trump, in separate comments to reporters at the White House, suggested that a “prorated down payment” on the wall, also without providing a concrete dollar figure, could be viable. “If they come to a reasonable agreement, I would support that,” Trump told reporters, referring to Schumer and McConnell. Schumer and Pelosi remain incredibly hardened over the barrier issue. But they are missing the average American’s viewpoint. And they don’t care. 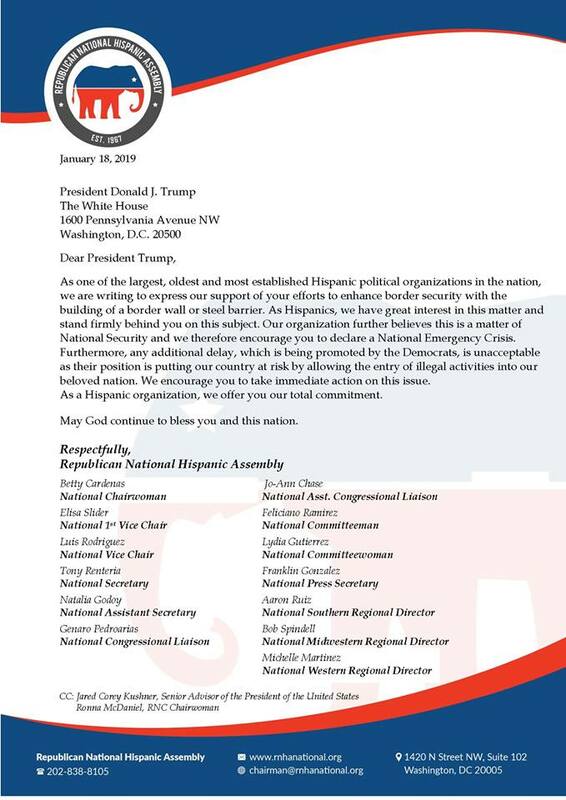 The Republican National Hispanic Assembly believes it’s a matter of national security to build the barrier. Trump made an offer that all of us can live with- not “amnesty” which would increase illegal migration. Will anyone finally listen?